Almost six months after Readdle introduced a completely redesigned PDF Expert app for iPad, the company has introduced a handful of fresh updates. 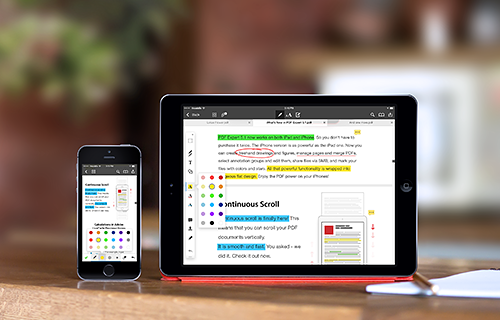 The latest incarnation of the PDF editing and annotating app introduces one big new feature in particular – iPhone support. The $9.99 app will, of course, be free for existing users to download to their smartphone. Besides speed enhancements, other new features include continuous scroll, to save you having to swipe between pages, while you can now carry out calculations in PDF forms that have been created in Adobe Acrobat or LiveCycle Designer.